This article is about the village in Scotland. For the community in Canada, see Kemnay, Manitoba. Kemnay, war memorial and main street. Kemnay (Gaelic: Ceann a' Mhuigh) is a village 16 miles (26 km) west of Aberdeen in Garioch, Aberdeenshire, Scotland. With a population of 3,830 residents aged 16 or over (2012), Kemnay is the third largest settlement in the Garioch after Inverurie and Westhill. The village name Kemnay is believed to originate from the Celtic words that mean "little crook in the river" due to the village location on the bend of the River Don. Kemnay House is classified by Historic Scotland as a category A listed building. Kemnay is popular with explorers of Aberdeenshire who can stay in numerous guest houses, hotels, and bed and breakfasts within the village. There are two pubs, the Bennachie Lodge and the Burnett Arms Hotel. There are playing fields available for use by the public at Bogbeth Park, which is also home to the Kemnay Skate Park. Golfer Paul Lawrie, who won the 1999 Open Championship is a former pupil of Kemnay Academy, as is former Aberdeen F.C. footballer Darren Mackie. Kemnay Academy, which unveiled a £14.3 million extension in 2015. 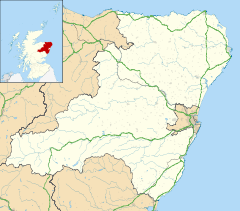 ^ "Settlements in Aberdeenshire which have a population greater than 500 (2012)". National Records of Scotland. Archived from the original on 14 May 2015. Retrieved 29 June 2015. ^ "Comparative Population Profile: Kemnay Locality". General Register Office for Scotland. Archived from the original on 7 April 2014. Retrieved 6 April 2014. ^ "Kemnay house, Ref: 9212". Historic Scotland. Archived from the original on 6 April 2014. Retrieved 6 April 2014. ^ "Kemnay Academy extension opened". Retrieved 2018-11-18.